Product #55632 | SKU 04190-0030700 | 0.0 (no ratings yet) Thanks for your rating! 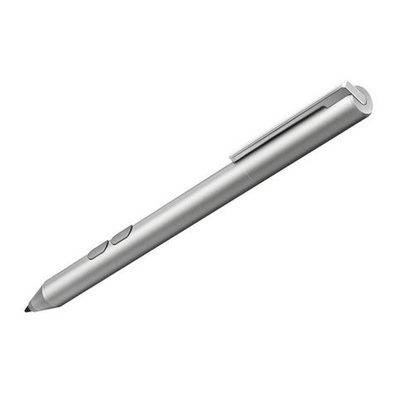 ASUS T303UA Pen is an active stylus with a slim and elegant aluminium design offering a premium feel. It's the perfect accessory for your compatible ASUS touchscreen device, allowing you to draw, write or annotate intuitively in any supported app. Its pressure-sensitive tip replicates a natural writing experience, and with up to 10 months of use from a single charge of its rechargeable battery, you'll be able to use ASUS Pen whenever and wherever you want. Natural, Pen-like Feel - To make ASUS Pen feel just like a real pen on paper, it can detect over a thousand minute variations in pressure as you write from 10g all the way up to 300g. It's perfectly calibrated to detect all the subtle variations and nuances of your writing or drawing, accurately reproducing the finest lines and the broadest brush strokes. Accurate, at Any Angle - Even an ordinary pen can't write at extreme angles, and that's true for a stylus too. But ASUS Pen is carefully designed to maintain accurate cursor positioning when it's tilted it exceeds the industry accuracy standard even when used at 45° so you can hold it at whatever angle is comfortable for you, and still keep full control. Near-instant Response - The last thing you want when using a stylus is a delay between the time you write something and the time it appears on the screen. ASUS Pen has a near-instant response time at almost any writing speed, so your creativity can flow unhindered!